During the Trojan War, Greek soldiers hid inside a large wooden horse which was presented to Troy as an offering to the goddess Athena. The soldiers eventually emerged from the horse, opened the gates and allowed Greek soldiers stationed outside to be able to enter and lay siege to the city. However, critics argue CETA, like other so-called trade agreements contain provisions that undermine national governments to the benefit of trans-national banks and corporations. Paul Hellyer is one such critic. In particular, he sees the ability of sovereign governments to finance critical infrastructure, environmental and other initiatives being jeopardized by CETA. Hellyer believes the time has come for a new social contract, but CETA once ratified would impede forever Canada’s ability to undertake these vital nation-building projects. 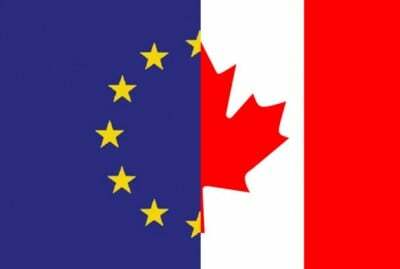 Paul Hellyer presented on this topic in front of an audience of about a hundred people at the University of Winnipeg as part of a speaking tour coinciding with talks between Canada and the European Union to finalize and sign the CETA. Video courtesy of Canadian Bank Reformers, and was originally recorded by community videographer Paul S Graham. Find the original raw recording here. CETA was signed in Brussels about ten days after this talk took place. It is now on course for provisional application by September 21, 2017. Paul Theodore Hellyer is an engineer, and political commentator. He is the longest serving member of Canada’s Privy Council having served in Canada’s House of Commons as far back as 1949 under Prime minister Louis St. Laurent. Hellyer has served as Minister of National Defence, and as acting Prime Minister. He founded the Canadian Action party in 1997 to provide Canadians with an economic nationalist option in the face of Free Trade and other legislation threatening the sovereignty of Canada. He has written multiple books addressing the theme of money, and threats to Canadian democracy. These include Funny Money: A Common Sense Alternative to Mainline Economics (1994), Goodbye Canada (2001) , Light at the End of the Tunnel: A Survival Plan for the Human Species (2010), and The Money Mafia: A World in Crisis (2014). The Global Research News Hour airs every Friday at 1pm CT on CKUW 95.9FM in Winnipeg. The programme is also podcast at globalresearch.ca . The show can be heard on the Progressive Radio Network at prn.fm. Listen in everyThursday at 6pm ET.